Oias Sunset Apartments is situated in a beautiful area of Santorini, the famous Oia village, known for the beautiful sunsets, the white washed houses and the spectacular views. Oia's Sunset offers a great accomodation in a quiet location but it is also near the nightlife of Oia. A great combination not only for couples but also for families and friends. 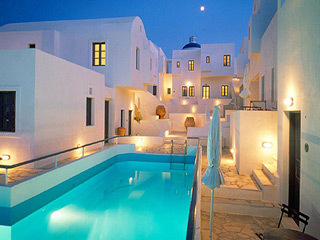 Oia's Sunset Apartment offer 8 double and triple studios and 7 apartments for two, three, four or even five people. All studios and apartments are simply and elegantly decorated and offer all the standard amenities, such as A/C and TV.The hotel offer many facilities. Have a wonderful morning at the breakfast terrace or relax by having a drink at the bar, have a swim in the pool, visit the pool bar and be sure to have a wonderful time!